On this page we have included a number of files which are free for you to download. These include some back copies of our popular Colchester Recalled Magazine and some short audio files from our extensive archive. As time goes on more files will be added to the list so keep checking on this page for the latest additions. And although these files are being made available at no cost, if you would like to make a donation to assist in the ongoing work of the Colchester Recalled Oral History Group, then you may do so by sending a cheque payable to Colchester Recalled to:- Peter Evans (Hon. Treasurer), 5 Grimston Road, Colchester, Essex, CO2 7RN, United Kingdom. This 'sound bench' is the first of eight set up across Essex with Lottery funding by the Essex Sound & Video Archive. The Colchester Recalled memories on it about the Castle and Castle Park can be heard by clicking the MP3 files below. 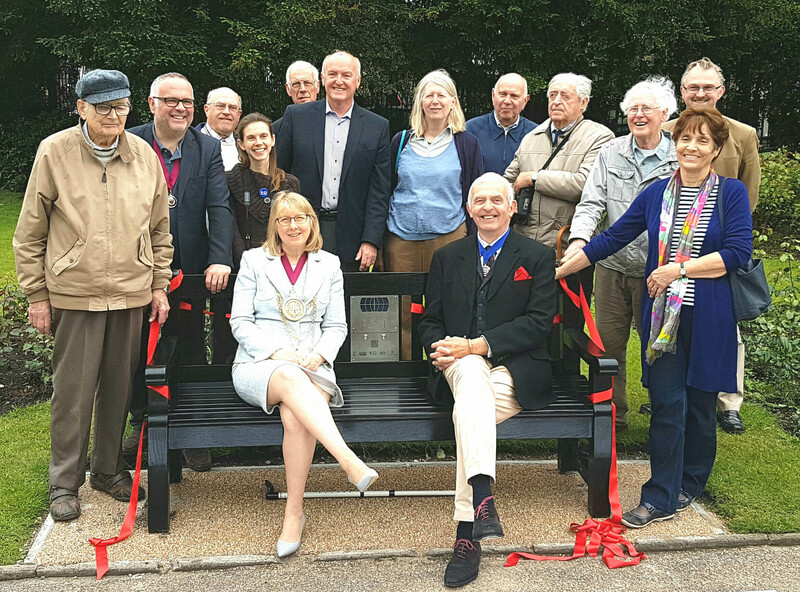 Seated on the bench are the Mayor of Colchester, Councillor Julie Young, and Essex County Council Vice Chairman, Councillor John Jowers. They are surrounded by Colchester Recalled officers, contributors to the recordings, key Borough Councillors and the Essex Sound & Video Archive team. 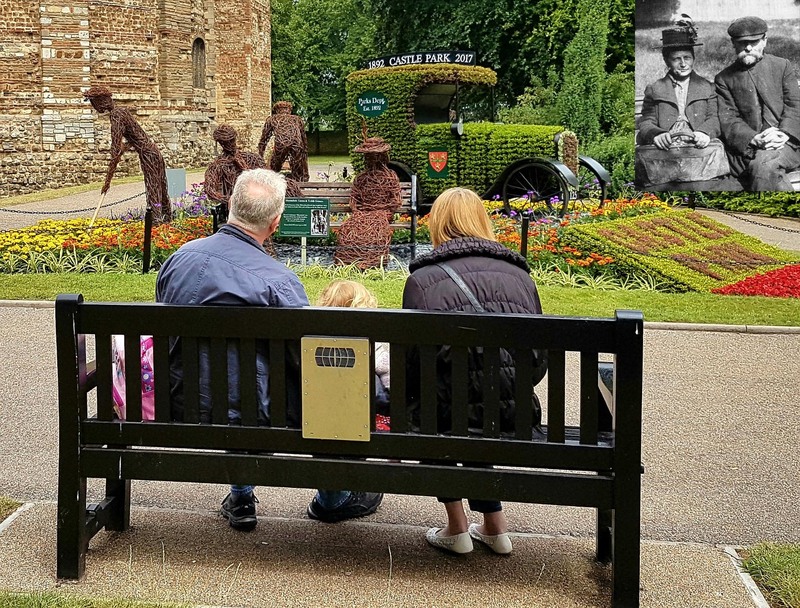 The latest floral display in Castle Park has to be the best ever and features among other things an old Austin 7 and two people sitting on a bench who are based on the real life characters Marmalade Emma and Teddy Grimes. You will also note that the display is right in front of the new sound bench where people can sit and listen to memories of old Colchester. The good news is that we have recently added some new content to the sound bench featuring recordings of Emma and Grimes themselves. It's well worth a listen either on the bench itself and savouring the atmosphere, or by clicking on the file below. You can also click on the PDF file to read a recent newspaper article featuring Emma and Grimes. © Copyright 2010 Malcolm Lench. All rights reserved.